As I think about the Almodóvar films I’ve seen, I have to really think about why I don’t embrace his work more. His sensibilities really do befit mine. He has a very particular stylistic approach that is visually stimulating yet never overbearing. 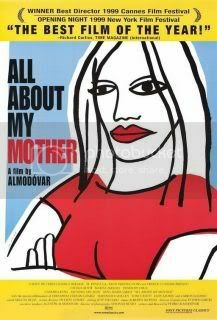 Almodóvar’s writing blends humor with melodrama in an effective manner, maintaining an impressive scale between characters and community – he really is a terrific writer (this being based entirely on All About My Mother (1999), Talk to Her (2002) and Volver (2006)). He neutralizes gender to the point where the lines between them are not clearly defined, and often does so as a means to comment on ascribed notions of sexuality. He seems to actively hit at my tendencies to look at films through a sociological lens. So why is it that I can’t fully embrace his work? It’s not that I would say any of his films are bad, but rather, they seem to be geared toward a very specific culture that alienates my understanding – problematic as it may seem, I suppose the simple answer is that there is a cultural barrier that prevents me from fully comprehending the gravity of his melodrama. All About My Mother begins on a somber note: Manuela (Cecilia Roth) takes her son, Esteban (Eloy Azorín) out to see a stage production of A Streetcar Named Desire. It’s his seventeenth birthday, and the two decide to wait out in the rain for autographs. During their rather long wait, Manuela confesses to her son that during her acting days, she once played Stella to his father’s Stanley – up to this point in his life, Esteban had not known anything of his father. Manuela promises to tell Esteban more once they get home, but a series of events results in Esteban chasing after a car in the rain – ultimately leading to his death. The loss is devastating and elevates the material beyond melodrama – it’s a very palpable moment when Manuela decides to give up her son’s organs at the very hospital she works in. In an effort to reconcile (and honor) her son’s death, Manuela leaves her work and goes to search for Esteban’s father to tell him the news. The journey takes Manuela to an old friend named La Agrado (Antonia San Juan) – a transvestite who used to live with Manuela and her ex-husband. From here, Manuela encounters a variety of women, including the actress who was partly responsible for her son’s death. The relationships that Manuela forms during her period of self-discovery are interesting, though at times, some of the grander comments that I sense Almodóvar is making are lost upon me. In spite of the melodrama and the very active humor, All About My Mother is an incredibly dense and rich film. Not to say a melodrama or comedy can’t be rich, but rather, for films of that type, this is one of the most symbolically charged and difficult to outright assess. So much goes on in individual frames, with Almodóvar actively bridging the gap between imagery and dialogue – All About My Mother is truly a masterful work. Future rewatches will undoubtedly prove to be fruitful, but as for now, I can’t shake off the fact that there is a greater social framework that I’m overlooking in connecting the dots.